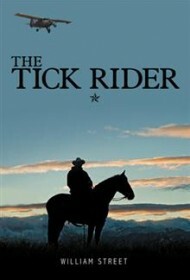 The fates of a noble cowboy and a beautiful Mexican woman become inexorably linked in The Tick Rider, a colossal western-themed thriller crafted by retired rancher William Street. The title character and hero here is Jack Leavitt, a young cowboy who has taken a job with the Texas Animal Health Commission, helping isolate and herd infected cattle to treatment centers. During one of his patrols, Leavitt stumbles upon a small ranch across the Mexican border, where he immediately falls in love with the rancher’s daughter, Gabrielle Ortiz. Jack’s father, who works for the Drug Enforcement Agency in Dallas, is justifiably concerned for the wellbeing of his son, who works in areas often controlled by the Mexican cartels. The story is sprawling and the cast is huge, including Alejandro Martin, a reluctant pilot who flies cocaine for the cartel from South and Central America into Mexico; Martin’s boss, Salvador Silva, a cartoonish, violent enforcer straight out of central casting for television’s 24; mob boss Ismael “El Toro” Locano, who heads up the Sinoloa cartel and wants to build a large storage hanger for drugs on Gabriella’s father’s ranch. Two other smaller roles help the author comment on the socioeconomic aspects of his cross-border story: Miguel and Guillermo are hard-working teenage boys who want to move to the United States but keep getting wrapped up in the machinations of the Sinoloa cartel. Naturally, all these storylines converge as heroes and villains clash south of the Rio Grande. The novel’s ambitious story is likely to appeal to fans of westerns and thrillers alike, but the novel’s dense structure and overreliance on exposition over storytelling will prove burdensome to readers who enjoy a swifter tale. Still, those who don’t mind mixing the deliberate pace of Robert Ludlum with the western bravado of Elmore Leonard will have a satisfying reading experience ahead of them.